Demobox is a quick & stylish way of getting a demo page up and running for your new react component. There are three ways to use demobox, for varying simplicity and flexibility. Take a look at the FAQ at the bottom, or head over to github to file an issue or ask a question. The demobox cli tool will turn a regular markdown file with annotated code snippets into a stylish demo page with editable examples. You can look at the markdown source for this page here as an example. Also the source for the demo page (demo.md) showcases a number of features. These go in the yaml frontmatter (similar to jekyll) at the top of the markdown file. ga: google analytics tracking code. If present, GA code is added to the bottom of the page. There are two configuration options associated with theming, colors and fontPair. Look at the themes page for examples and more information. There are a few suffixes you can put onto headings that will give them extra properties (See the markdown source of this page for an example). (||) makes the section part of a column group. Adjascent sections (of the same heading level) that have this marking will be rendered side-by-side. An example of this is the demo.md and "demo.html rendered page" sections above. Configuration options can be given as data-* attributes on the textarea. Look at the html source of this page (and the demo page) for example usage. If you install the demobox library from npm (npm install -S demobox) then you can use the DemoBox react component in your project. In this demobox, you can play with the DemoBox component :). Why not use jekyll / some other static site generator? 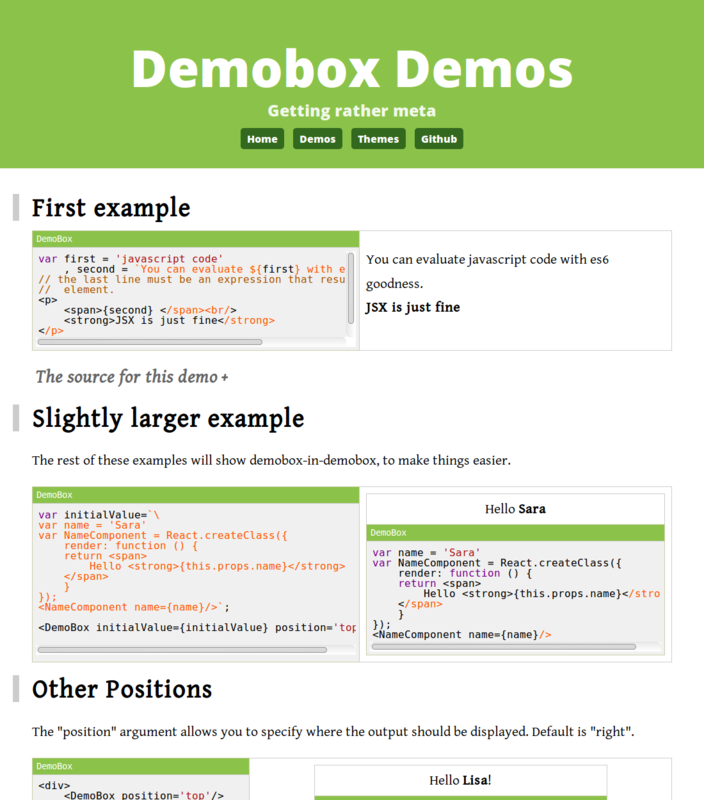 Demobox is for quick and simple jobs, and requires very little configuration to get something usable and beautiful. You don't have time to set up a full-blown website for each little component you create, but you want a way to show the world what you've done in a classy way. Why not use jsfiddle / plunkr / codepen for embedding editable code snippets? Demobox works with vesion control; jsfiddle etc. does not. Demobox also has first-class support for JSX and React components (and support for HTML/CSS coming soon! ).